August | 2016 | Cooking is Fun … Really!! I’ve mentioned my vegi-phobia over the years, so I never thought that I’d make a post about THIS. 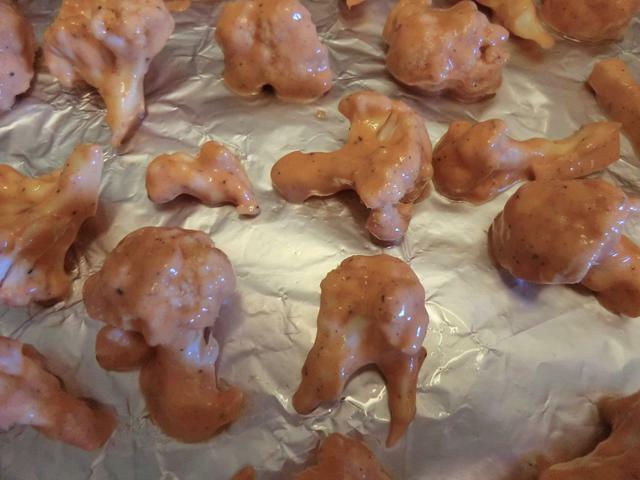 I remember my mom dipping cauliflower florettes into seasoned flour and then beaten egg before shallow frying them. 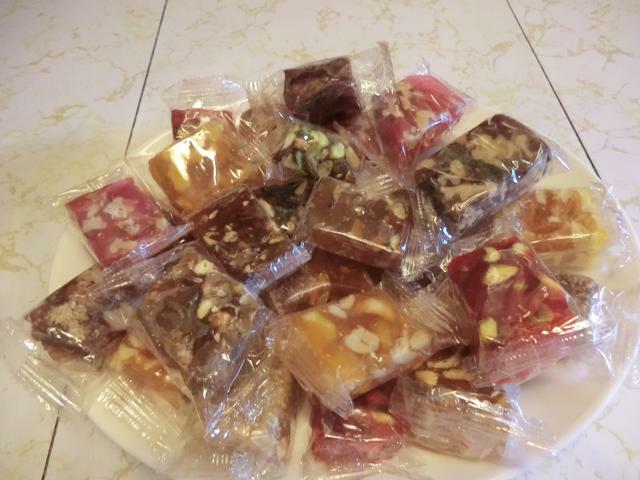 I don’t know what they tasted like, cause I never tried them. 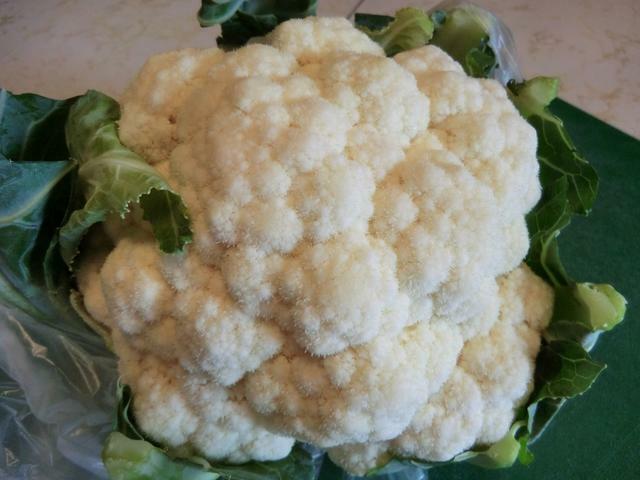 I HAVE had steamed cauliflower as part of the ‘mixed veg’ on my plate in restaurants, but they were soggy and flavourless. 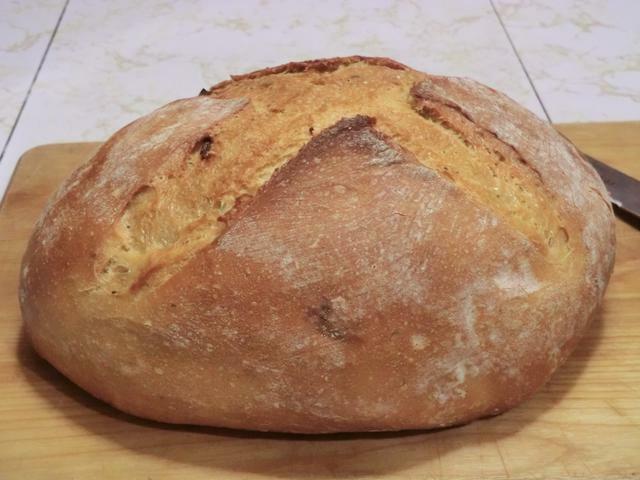 Not exactly something I ever wanted to replicate at home. 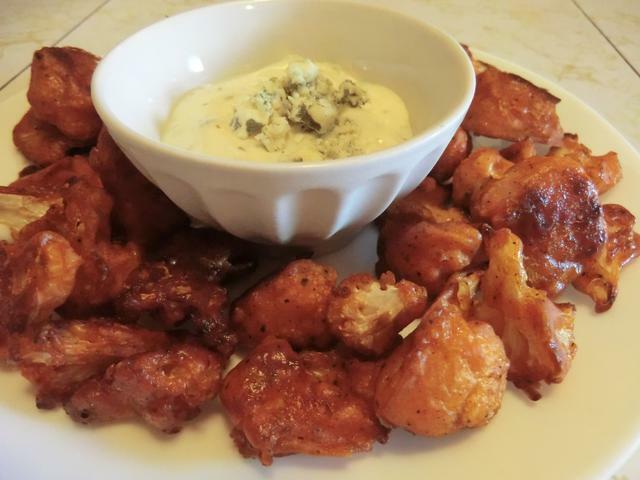 But I recently ran across a spicy hot ‘vegetarian’ version of Buffalo chicken wings made with cauliflower florettes and couldn’t resist trying it out. It’s just a bit fiddly to prepare but crunchy enough to appeal texturally and with enough spice to satisfy anyone who likes things ‘hot’ hot. 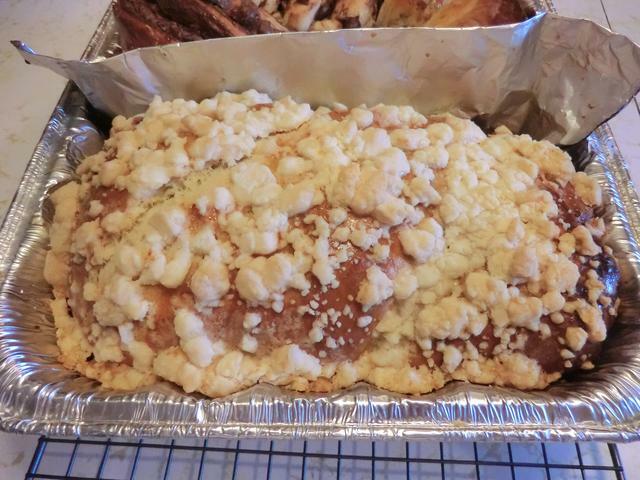 The original recipe had a batter for the cauliflower made up of seasoned flour, milk and water, baked, turned and then basted with a hot sauce/melted butter. 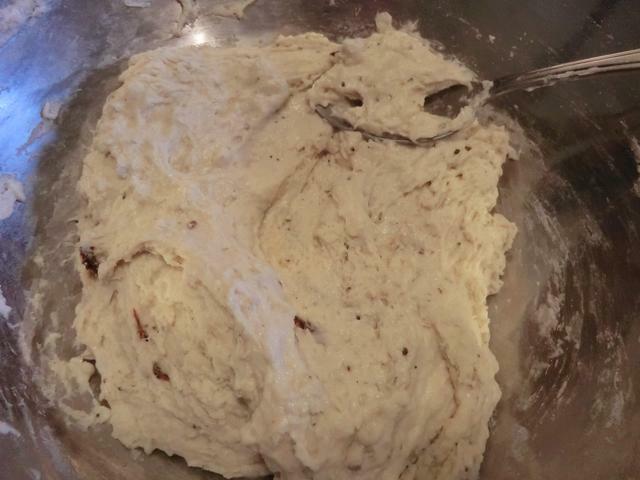 In the reviews, someone suggested adding the hot sauce to the batter itself as a substitute for some of the liquid. So that’s what I did. 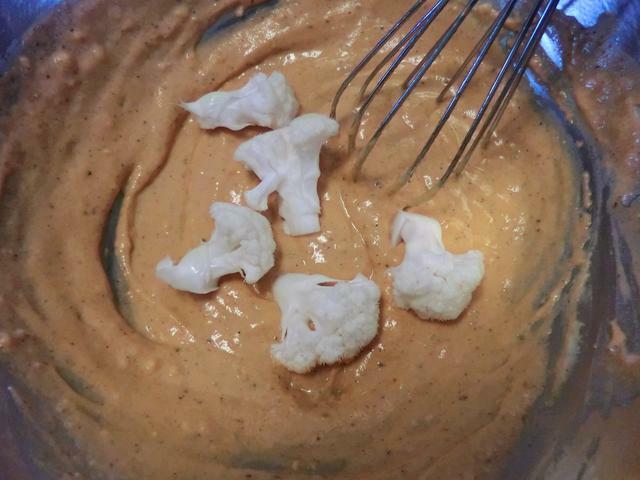 Because the hot sauce is absorbed by the cauliflower, a little hot sauce goes a lot farther without any wasted. The heat sneaks up on you so you may not be aware of it until later. Just a word to the wise. Pre-heat your oven to 425-450 deg F depending on whether or not it runs hot. Generously oil a baking sheet. 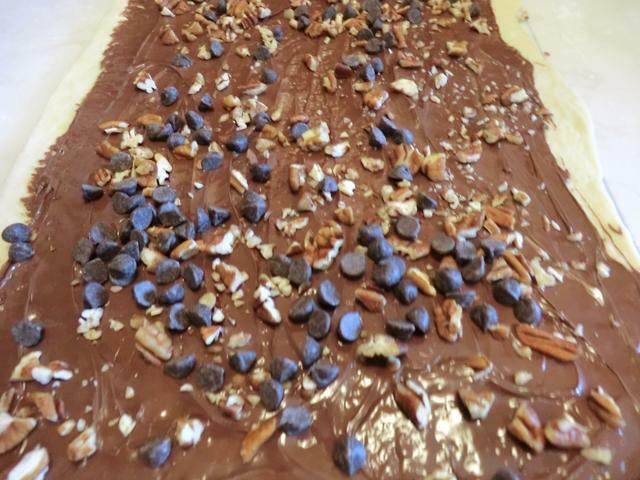 Or, if you prefer to cut back on the fat, line the sheet with parchment paper. 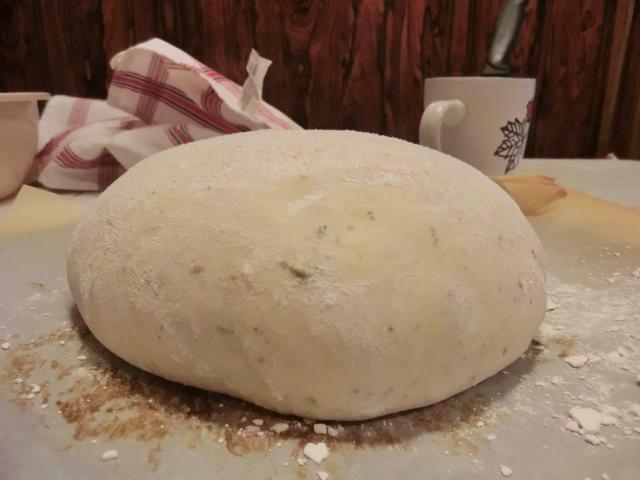 Add salt, pepper and spices to the flour. Whisk in the hot sauce and water until you get a smooth batter. 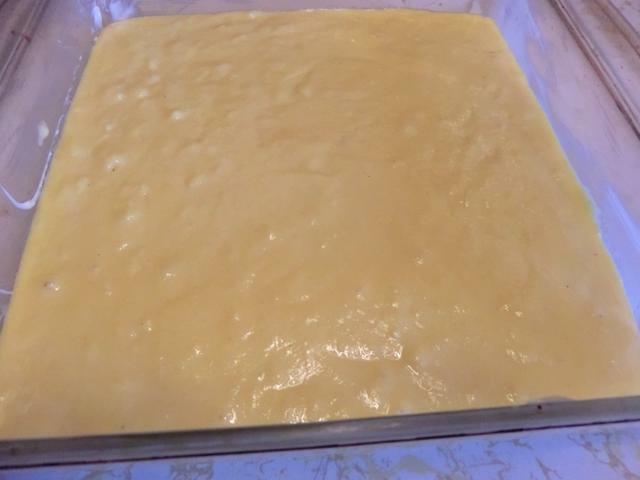 You may want to add a bit more water to thin the batter enough to coat the florettes evenly. 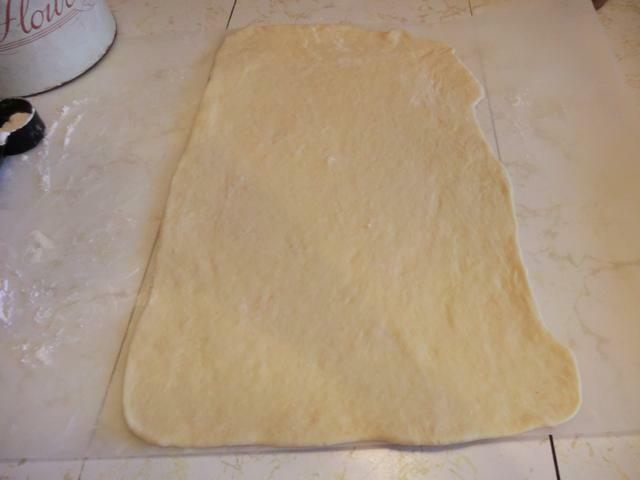 Spread the florettes evenly over the baking sheet, one layer thick, and bake for 20-25 min. Turn over each florette and bake for another 20-25 minutes. Watch carefully as, at the higher temperature, that extra 5 minutes may result in burned bits. Indian cooking is quite complex. There are regional and religious variations. And, of course, familial preferences. So, when I went searching for a recipe for this dish which combines potatoes (aloo) and cauliflower (gobi), there were endless versions. 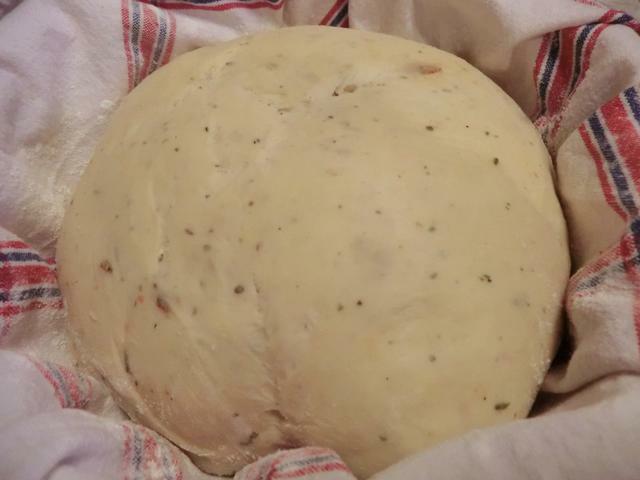 The first version I looked at used what many consider the Indian ‘trinity’ of onion, garlic and ginger paste … which is often the base for a wet preparation or masala along with peeled, seeded and diced tomatoes. 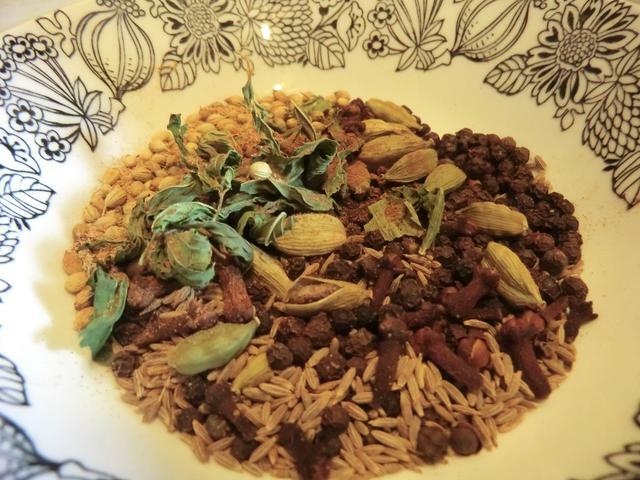 The second version omitted all three and focussed on toasted whole spices as well as the ground form to give the dish flavour … in what was usually a dry preparation. Prior preparation of the vegetables also varied. Potatoes and/or the cauliflower were sometimes parboiled or steamed separately until tender before adding them to the saute pan. Personal preference and convenience may dictate the method used. 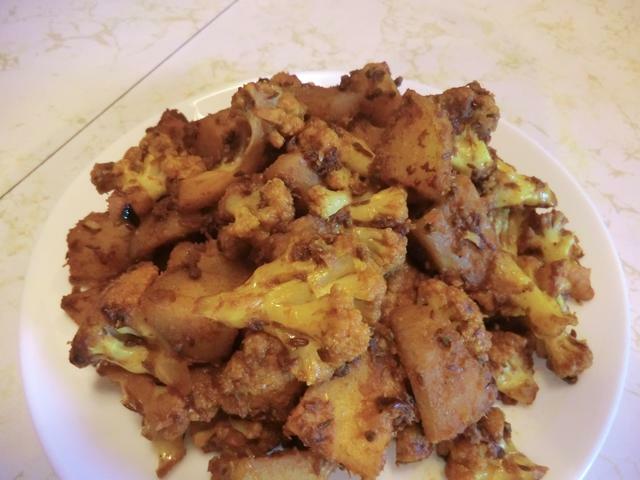 The recipe below is my novice attempt at aloo gobi along with some variations. If you have leftover steamed cauliflower or baked potatoes, you can save yourself some work and use them instead of cooking everything from scratch. ** I used 1 tbsp mulato/chipotle pepper puree cause I had it around but you might want to just use ground red chile pepper. NOTE: You can also use a paste made up of garlic (1-2 cloves), ginger (1 tbsp grated) and onion (1/2 medium size) as a base for this dish. 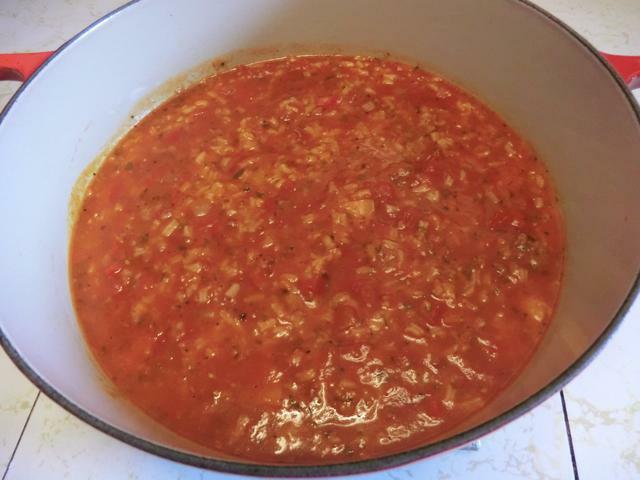 For a wet dish, you might want to add a couple of peeled, seeded and diced tomatoes with their juices and a bit of water to make a sort of sauce that you can serve over basmati rice. For a heartier dish, peas and/or carrots may be added along with the cauliflower. Par-boil the potatoes in a large saucepan of boiling water for 10 minutes. Drain well and set aside. Add the potatoes, the ground spices and salt and cook for 7-10 minutes, until the vegetables are tender. You’ll probably need more salt than you think as the potatoes and cauliflower soak it up. (A splash of water will help dissolve the salt and help it get absorbed by the potatoes and cauliflower.) Taste both the vegetables. Garnish the aloo gobi with coriander and serve with tomato and onion salad and pickle for an Indian menu. 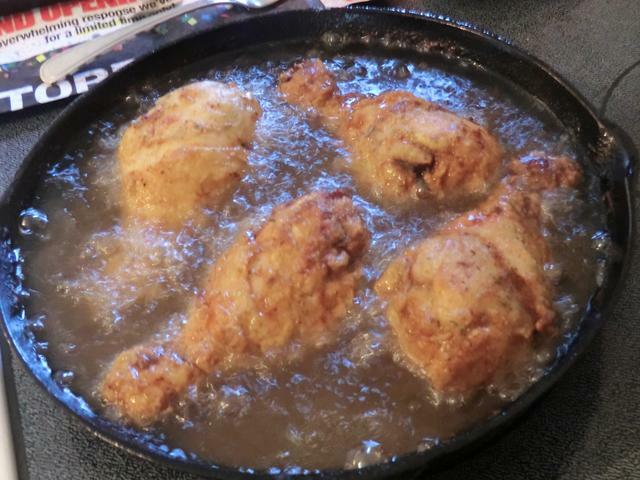 Fried chicken … just thinking about it makes me happy and sad at the same time. I’d never made actual fried chicken, in my life, but I decided to finally make the attempt with two weeks left of my summer vacation. 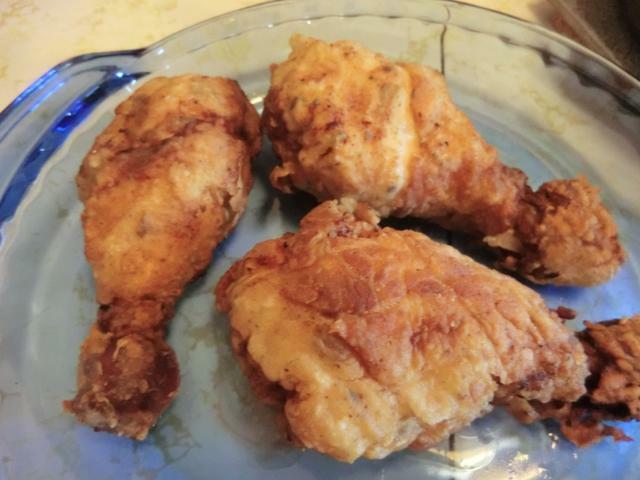 Perhaps it was because I had buttermilk in the fridge, that I wanted to use up, and four plump drumsticks in the freezer. In any case, something just clicked. 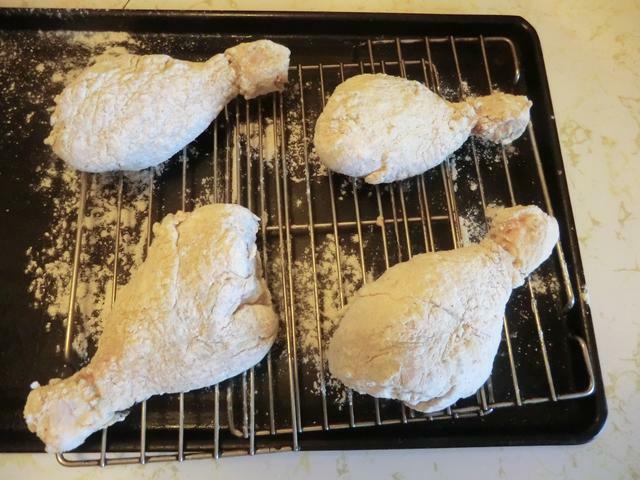 Drumsticks marinated overnight in buttermilk, salt, pepper, ground sage, dried rosemary and parsley and then dipped into a mixture of flour, salt, pepper and a bit of cayenne pepper. 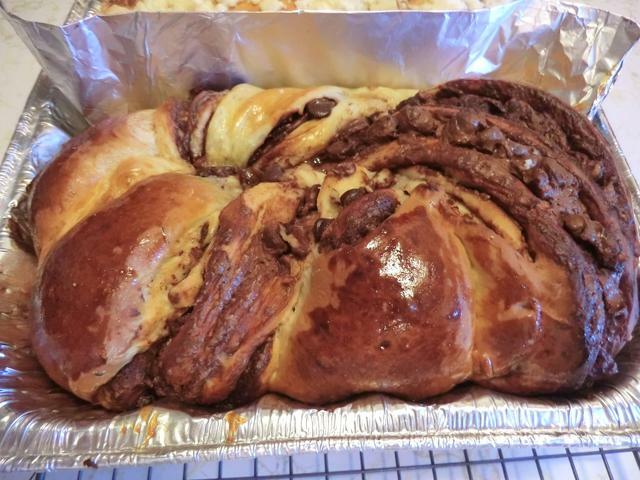 To make a long story short … it was messy as I suspected it would be. The results were tasty … hot or cold. Nibbling on a cold drumstick at 10 pm was a guilty pleasure. And, I’m never frying chicken again. 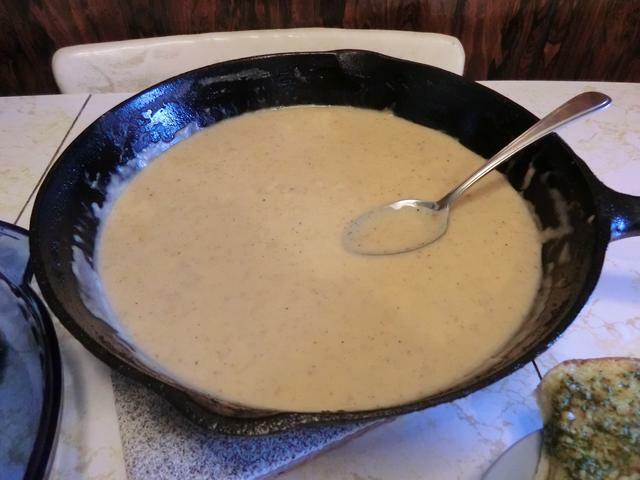 As to the buttermilk gravy … again, there were issues. 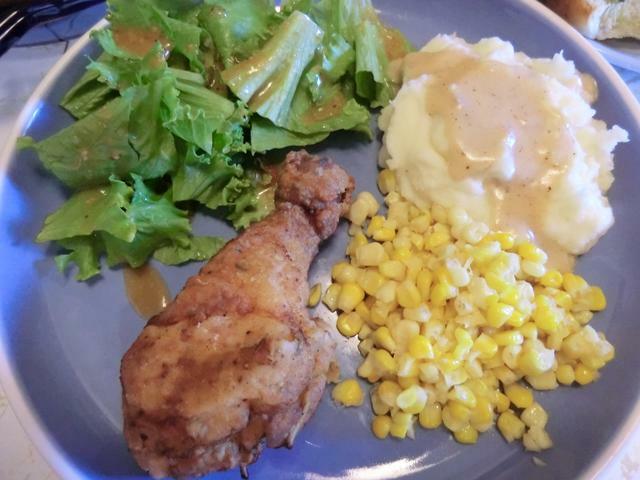 By itself, the buttermilk made the gravy too tangy for my taste. 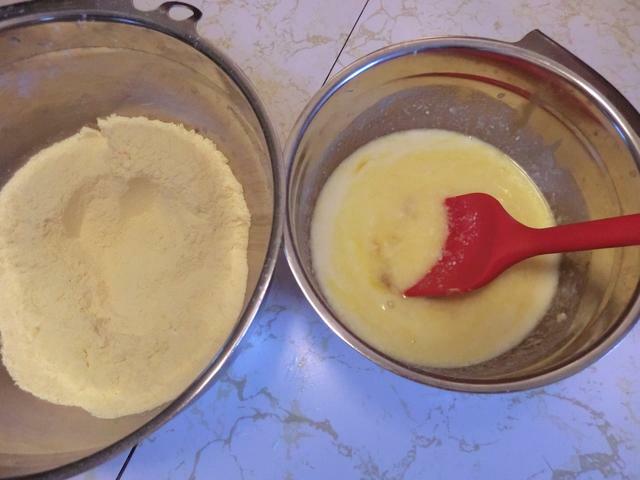 About 1/2 cup of buttermilk to 1 cup of regular milk is pretty good though. 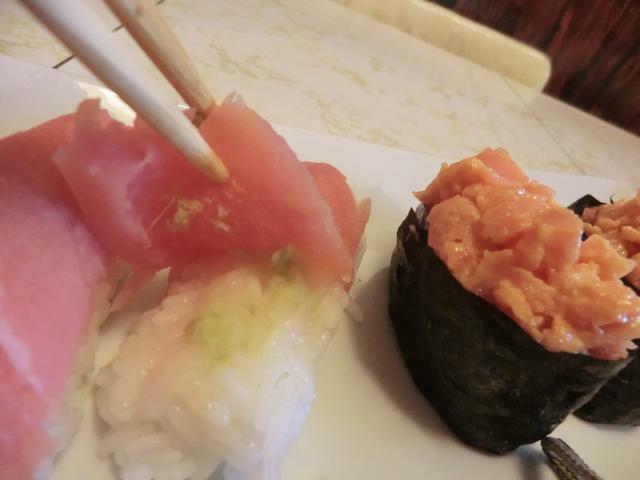 When I’m happy … I want sushi. When I’m sad … I want sushi. When I’m bored … I want… I think you can pretty much figure out where this is going. 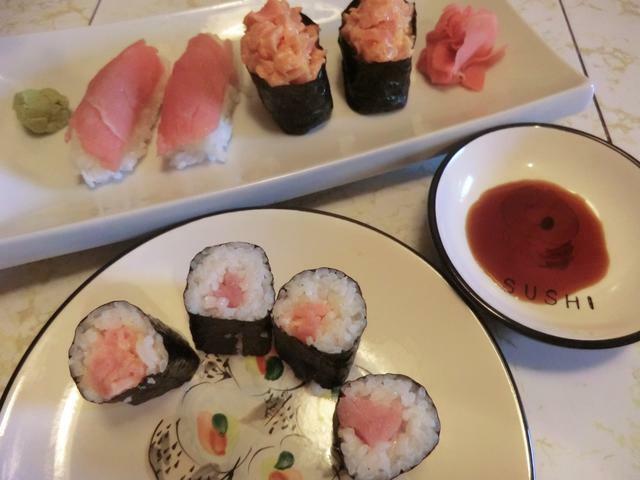 BUT, sushi is pricey, so I go digging through the pantry and the freezer for inspiration, and then I come up with dishes that will fill my tummy and not empty out my wallet. 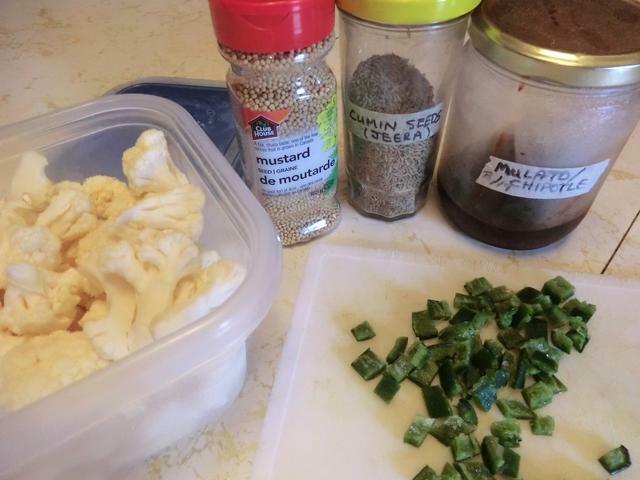 I haven’t made chili in a while and a recent exchange with “The Frugal Hausfrau” about chili and the obsession of some people over what makes the perfect chili came to mind. So, I decided to make chili and NOT use any commercial chili powder. 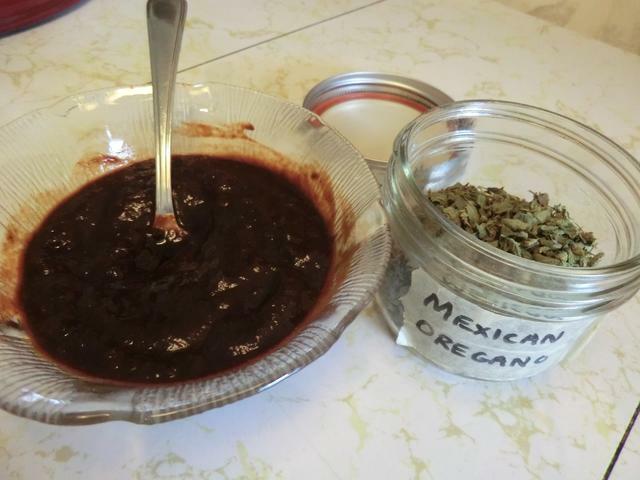 Instead, I soaked and pureed the last mulato chile in my pantry, and combined it with some frozen chipotle in adobo sauce, ground cumin, minced garlic, and Mexican oregano. All ingredients in the commercial chili powder in some form or other. In a large dutch oven, over medium heat, saute the onion and garlic until the onion is translucent. Add half (or all) of the mulato chile puree, chipotle, cumin and oregano and fry for a few minutes. Add the crumbled ground beef and salt and brown, breaking up as you do so. Add the drained, cooked beans and tomatoes with all their liquid. Bring to a boil and then reduce heat so the contents simmer. Partially cover the pot and simmer for 30 minutes or until the chili is the consistency you prefer. Taste and add more salt if needed. You may choose to add hot sauce to the pot or to individual servings. Garnish with diced avocados, grated cheddar or Monterey jack cheese or sour cream and serve with cornbread. PS: My definition of spicy is ‘flavourful’ NOT ‘hot’. If you want heat, a few splashes of your favourite hot sauce will do the job. 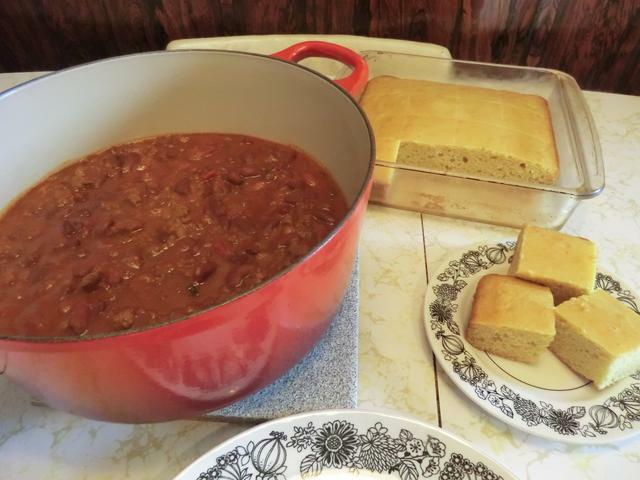 And what bowl of chili is complete without a square or two of sweet cornbread? No jalapeno peppers, whole kernel corn or grated cheese to doctor it up. 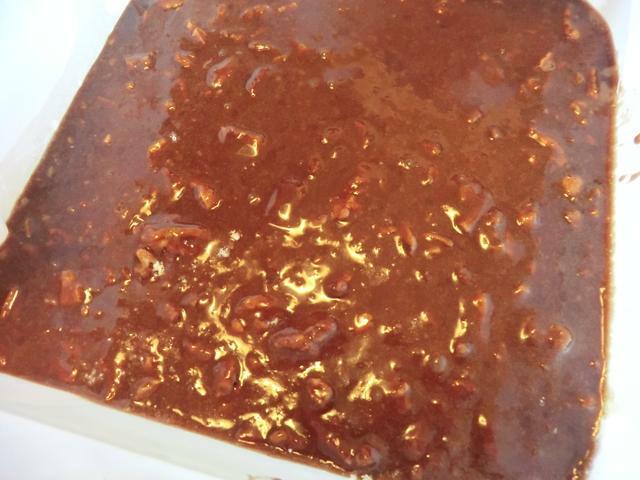 Just a bit of honey in place of the sugar and I was in chili nirvana. 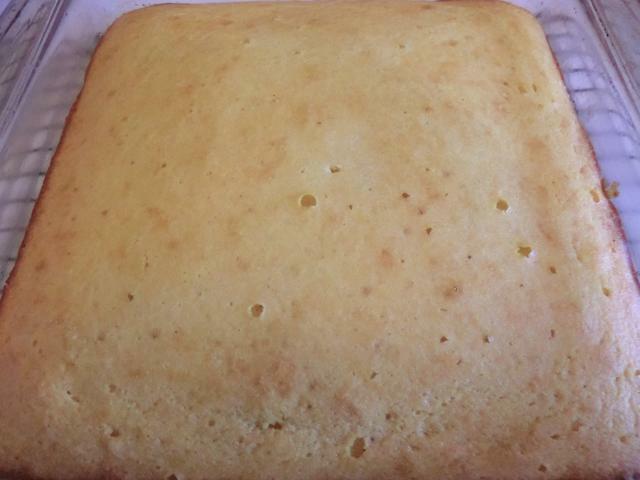 Martha Stewart’s cornbread recipe is almost identical to the one I used but I’ll post it if anyone is curious. ** I used 1/4 cup wildflower honey this time cause I wanted it sweet and buttermilk cause I had some available. Stir together flour, cornmeal, sugar, baking powder and salt. In another bowl, beat together eggs, milk and oil. Add to flour mixture and stir just until batter is moistened, no more. Pour into greased 9″ round cast iron skillet (or an 8 inch by 8 inch baking pan, but really, the cast iron makes it taste better) and bake in a pre-heated oven at 425 deg F for 15-20 minutes until golden brown or until a toothpick inserted into the center comes out clean. 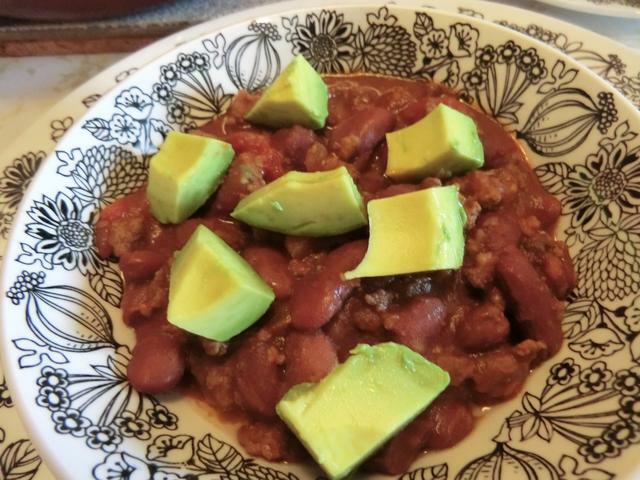 Even better … I now have several containers of chili to stash in my freezer. And a tub of cornbread. I’m bored and have nothing much to do these days except cook little throwaway dishes. While visiting the city market on Sunday morning, I stopped to chat with the fish monger. 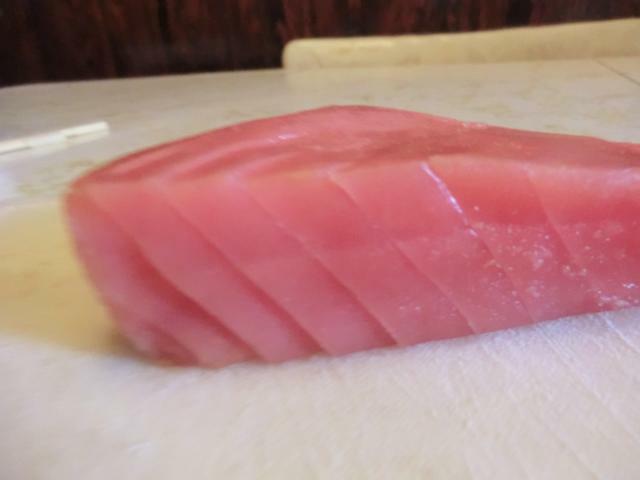 He’s the closest source of “sashimi grade” ahi (yellow fin) tuna I have that I can buy before the sushi restaurants in town snap it all up. 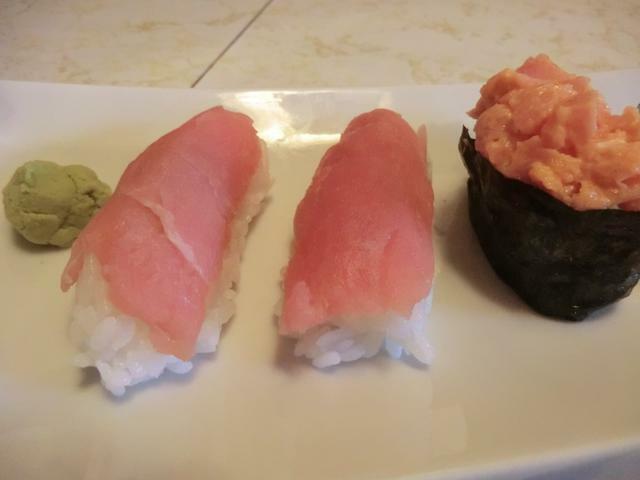 I bought a small piece of vacuum packed tuna and made 3 kinds of sushi with it … one hosomaki (thin maki rolls with a single filling), 2 nigiri sushi and 2 gunkan (battleship) sushi. 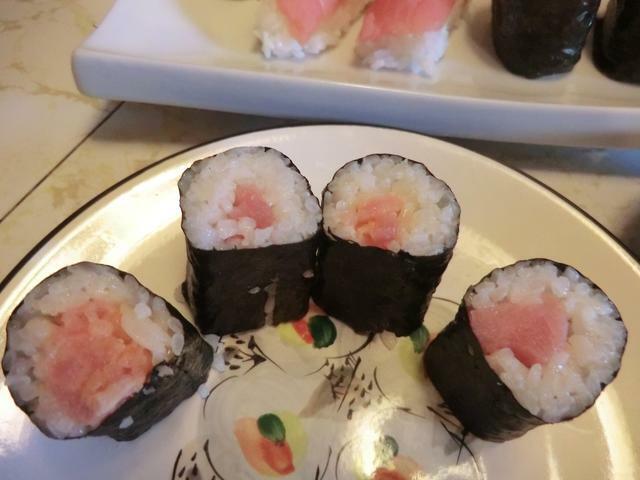 I made the mistake of buying a package of 200 half nori sheets, so my maki rolls have been sloppy when I tried to stuff them with the usual 2 or 3 fillings I use. For a single ingredient, like tuna, tempura shrimp, a couple of very thin or one thick asparagus spear, the nori sheets are just fine. If you ever do this, you CAN slightly overlap the 2 half sheets and get more filling inside, but I haven’t yet. Maybe tomorrow. Nigiri sushi – an oval (~5 cm) of sushi rice, smeared with a bit of wasabi paste and covered with topping of raw fish, sweet Japanese omelet etc. Not a great job of slicing the tuna but passable. 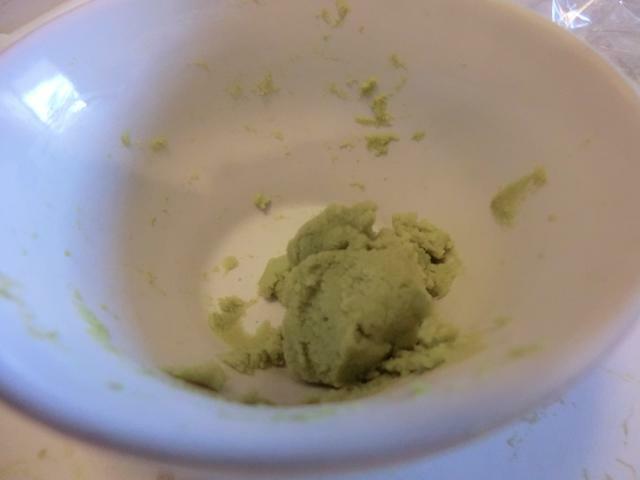 In a small bowl, stir the two ingredients together with a single chopstick, about 10-15 min before you want to use your wasabi. Cover the bowl tightly with a piece of plastic wrap and refrigerate. Don’t make more wasabi than you’ll use as the hotness levels decreases dramatically with time. 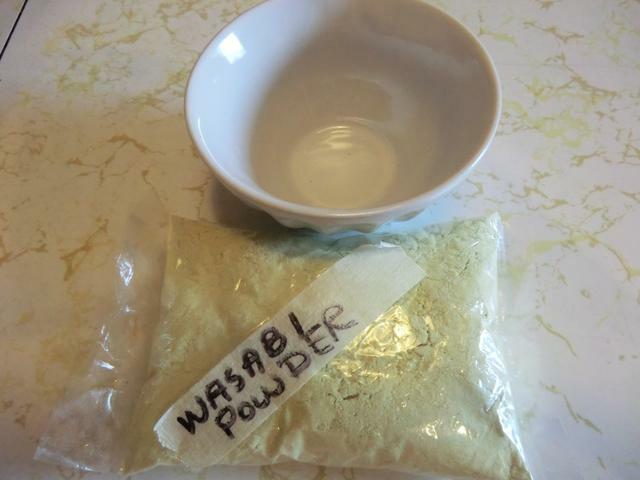 ** Your wasabi powder should be a pale green colour and in a sealed bag, preferably vacuum sealed. 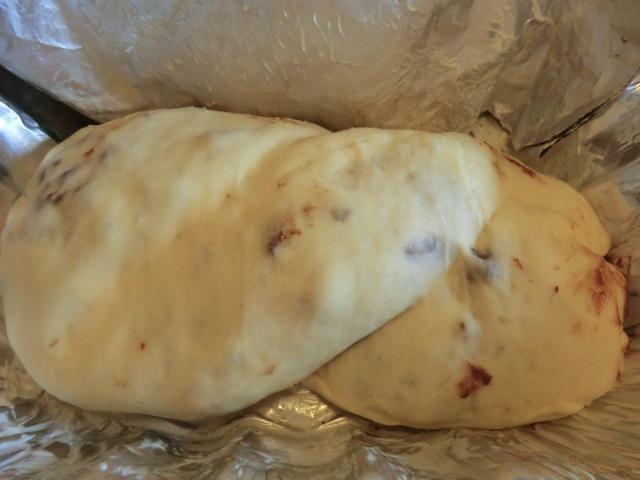 Once you open your package, store the rest in an small air tight container in the freezer. Stir until sugar and salt is dissolved and store in a small tightly sealed bottle in the fridge. 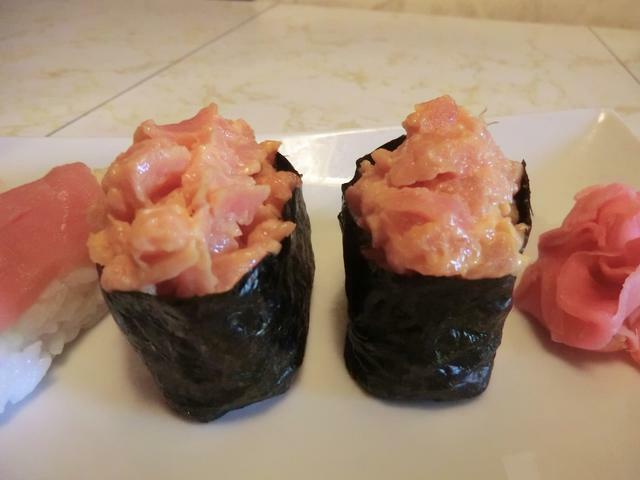 Use 1 1/-2 tbsp per 1 cup sushi rice that’s been cooked with 1 1/3 cups of water. 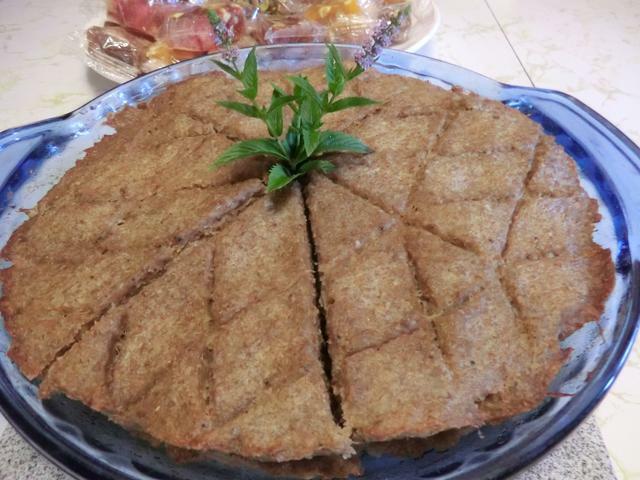 Kibbeh is a delicious Middle Eastern appetizer, mezze offering or main dish. Served with tzatziki or other yogurt based sauce, few people would pass this by. 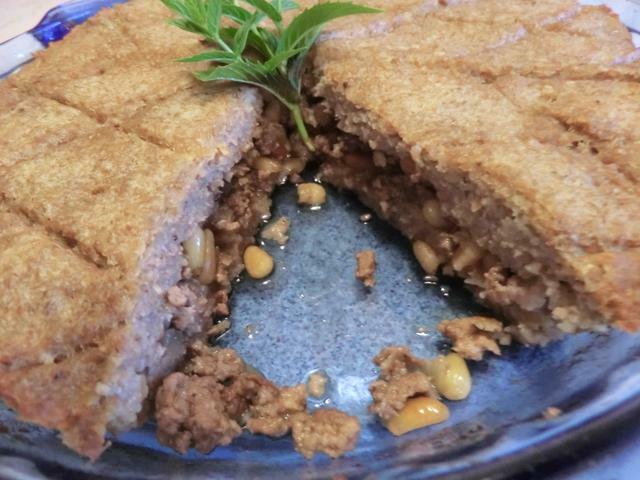 I’ve made the individual stuffed version but it’s fiddly to make and then you have to shallow or preferably, deep fry, the football shaped kibbeh. 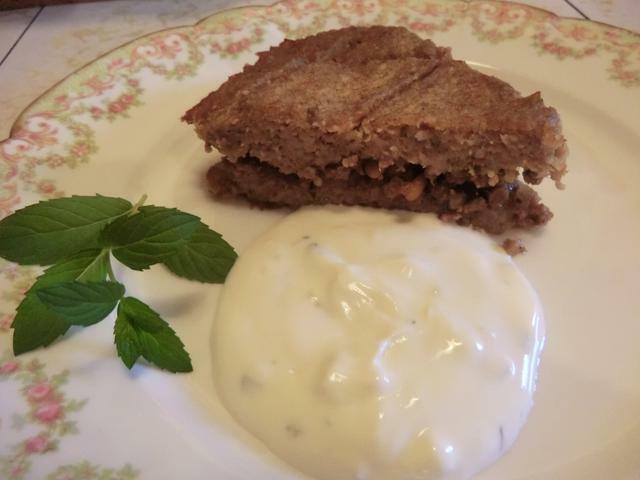 I chose to make this kibbeh in a pie plate, but you can also make it in a 9×13 inch baking dish and cut them into diamond shapes. My first attempt used only beef but a combination of half beef and half lamb is even tastier. 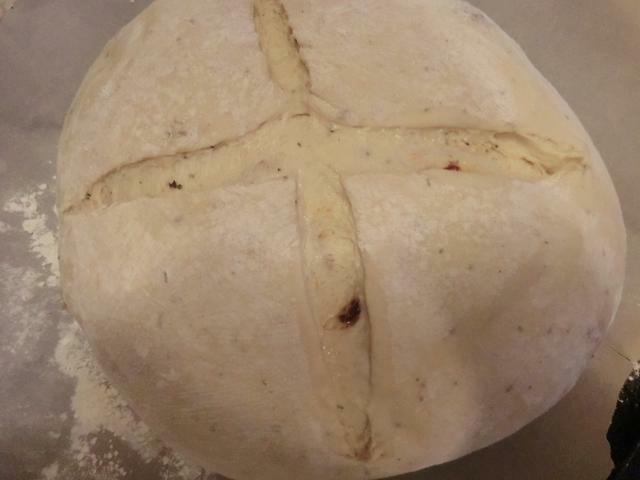 You can use the same recipes for this version except bake for 40-45 min in a preheated 350 deg F oven. 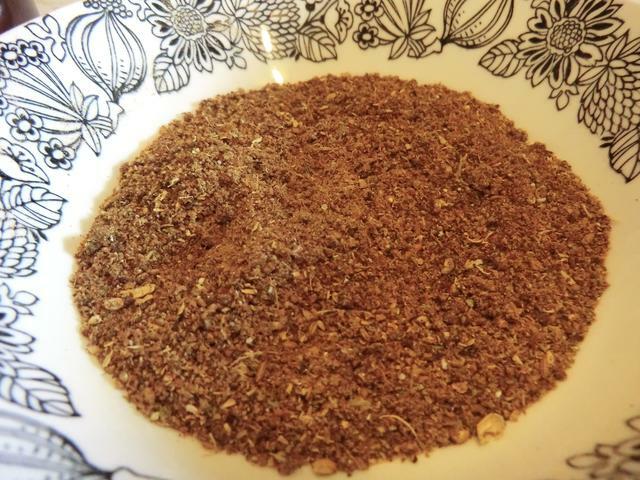 I added 2 tsp of the Baharat made below to the filling and 1 tbsp to the shell mixture. Toast dried, whole spices lightly. Let cool and grind in coffee grinder. Store in dark bottle in the fridge or freezer. I was planning on sleeping in on Sunday and then doing a quick run to the city market to buy some things I need for next week’s cooking. Well, I picked up a couple of goodies for lunch too, and something NOT on my shopping list. At around 2 pm, I was bored so I decided to get started on the cooking early. 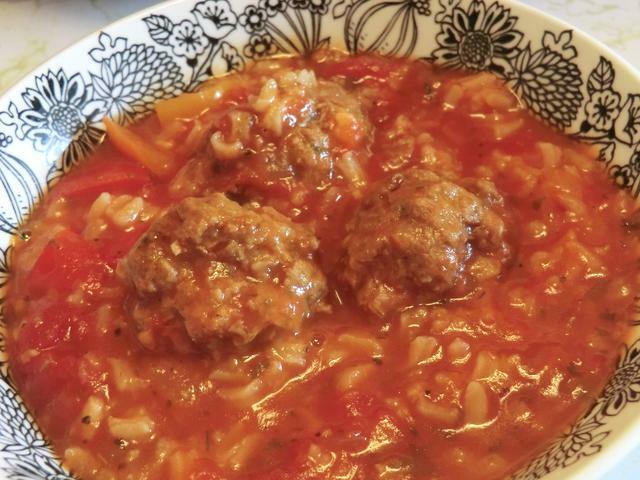 I was going to make a big pot of stuffed pepper soup since I had a couple of peppers in the crisper and I had bought extra ground beef … and then I had a BRILLIANT idea. Why bother using up a pound of ground beef that I just bought, when I had almost 2 dozen perfectly good cooked albondigas (Mexican meatballs with rice) in the freezer. So, I made the rest of the dish and added the albondigas and 1/2 cup of raw long grain rice for the last 20 minutes of cooking. A hour later, I had 6-8 servings of an amazing soup hearty enough to be a meal. 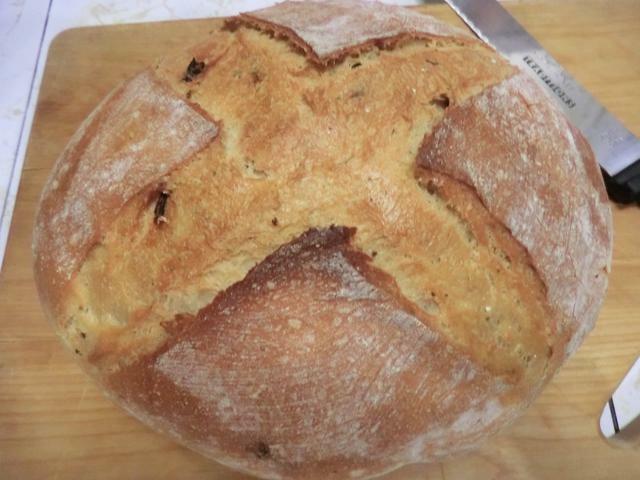 All it needs is some bread for dipping into it. 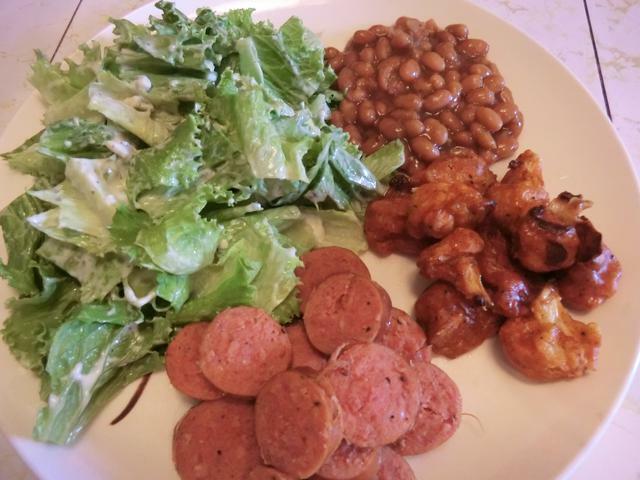 Even though there are lots of dirty dishes (mostly empty containers) in my sink, the prep for today’s supper was minimal and the actual ‘cooking’ a no brainer. 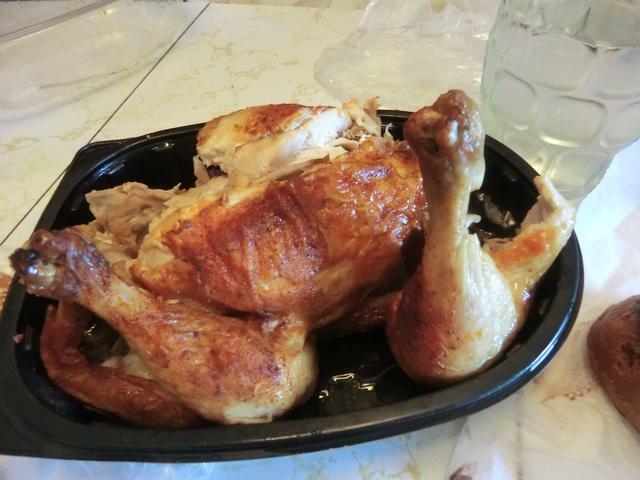 A couple of weeks ago, I succumbed to the temptation of buying one of those rotisserie chickens at the grocery store. They’re a bit heavy handed on the seasonings (translate that to salt) but sometimes you just want something hot and filling. 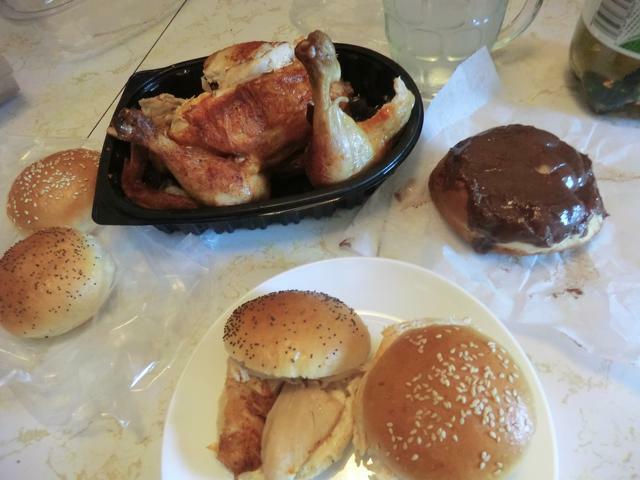 After making a couple of sandwiches with one of the breasts, and nibbling on both wings to fill out any empty spaces, I had a cup of coffee and that donut. Then I froze away the two legs, the second breast and the carcass in separate containers. 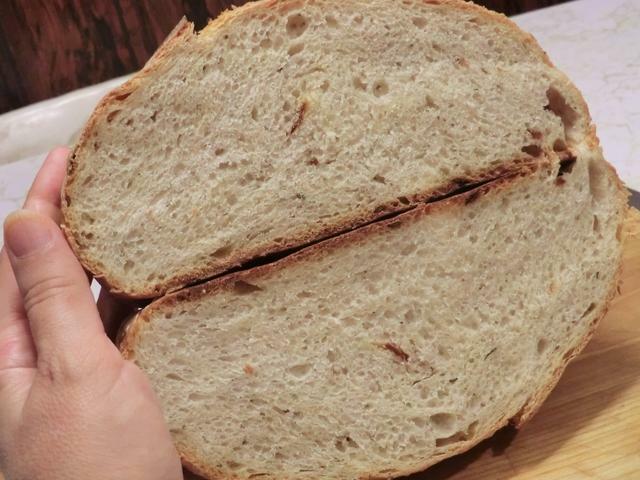 Yesterday, while the house was cooling off with the new A/C motor installed, I devoured the thawed second breast on my last 2 ciabatta buns for lunch. Supper was leftover kale and tofu miso soup and tamales from my freezer. Today (Saturday) was more of the same. 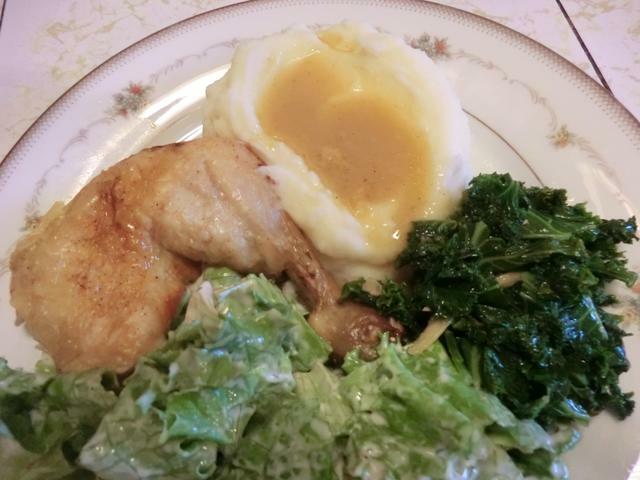 I thawed the package of chicken legs, made mashed potatoes, gravy (with the juice from the rotisserie chicken, which I had saved) and some quick chicken broth. Salad had already been prepped and the greens … well, I had a couple of cups of kale prepped as well, so I sauteed them with some olive oil, dry red pepper flakes and thinly, sliced garlic. 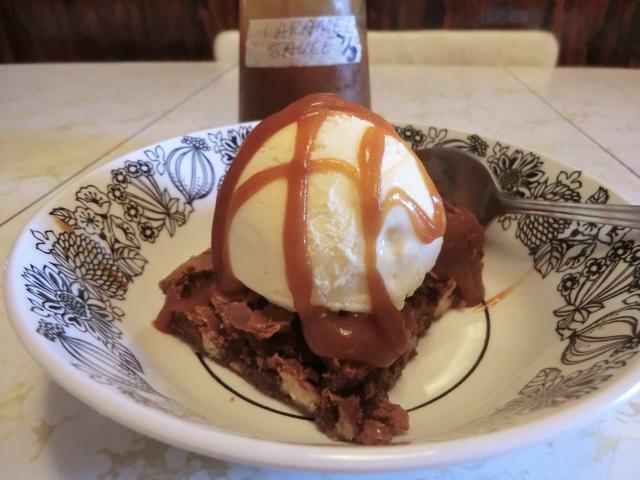 Dessert was the last of the brownies from the freezer with vanilla ice cream and salted caramel from the fridge. 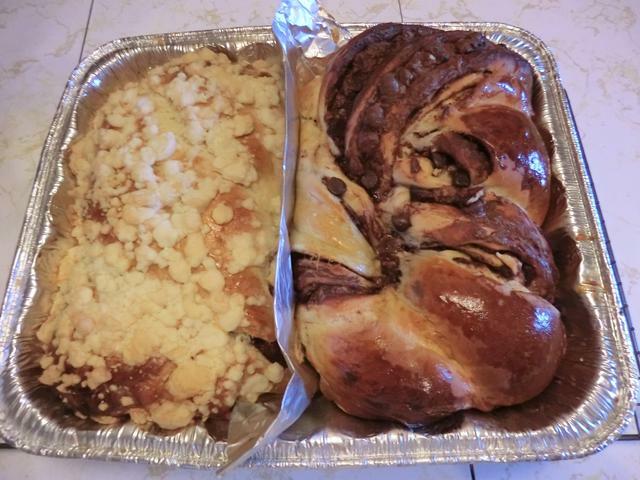 If my mom had been here we would both have been stuffed, but since it’s just me, I have leftovers for Sunday supper. 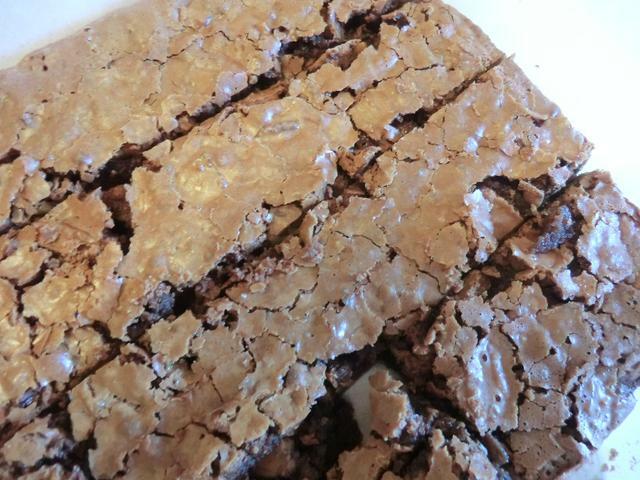 Although the brownies I made last time were tasty, they weren’t the shiny crust version that I wanted. 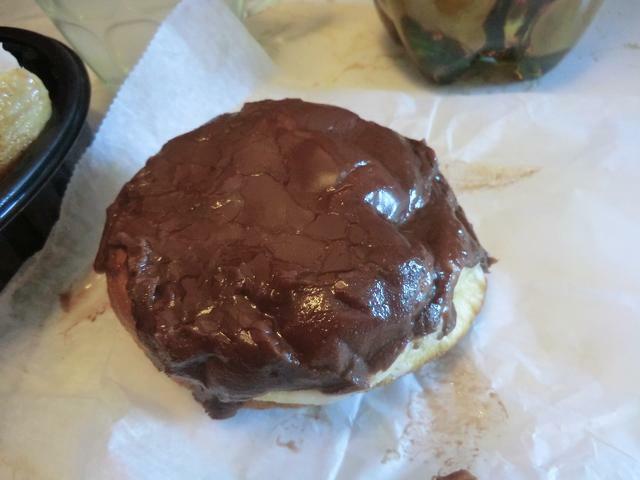 It seems you need to use melted chocolate for those. 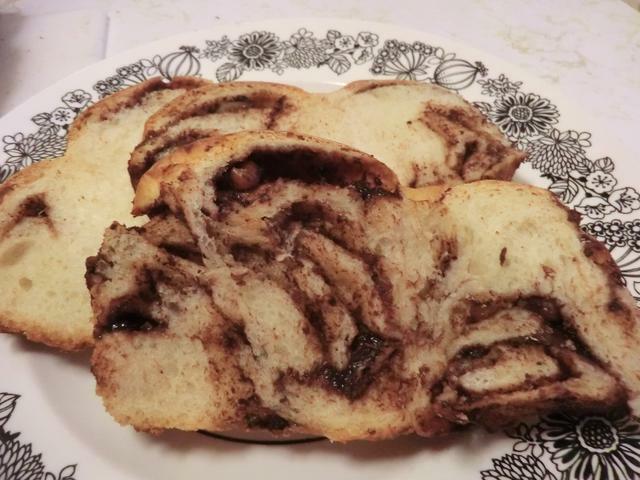 Recently, I ran across a newspaper cutting, from the days when we still subscribed to an actual newspaper and I cut out recipes from the Wednesday food section, and gave it a try. This is the version I remember making years ago. 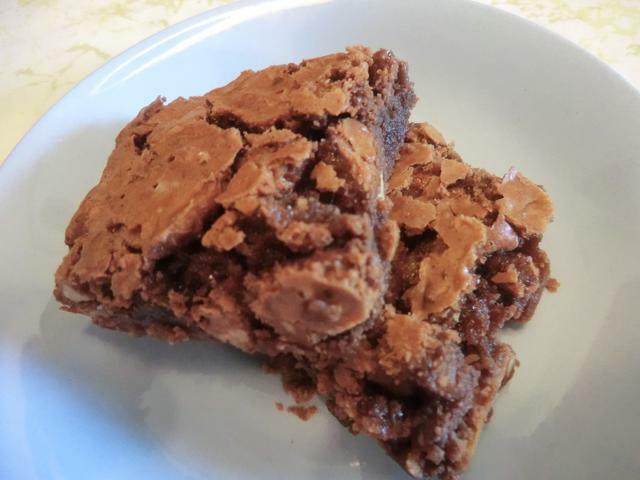 Grease an 8 x 8-inch-square pan, preferably lined with parchment paper to make removal easier when thoroughly cooled. 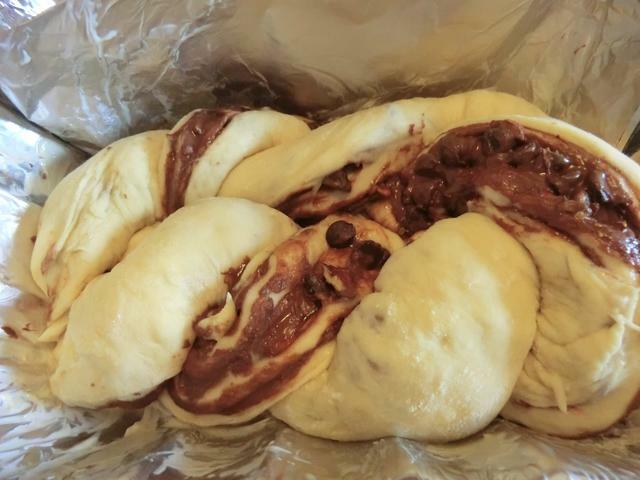 Melt together butter and chocolate in a saucepan over low heat, then take the saucepan off the heat and transfer the butter-chocolate mixture to a large bowl. Let cool a bit so you don’t cook the eggs. 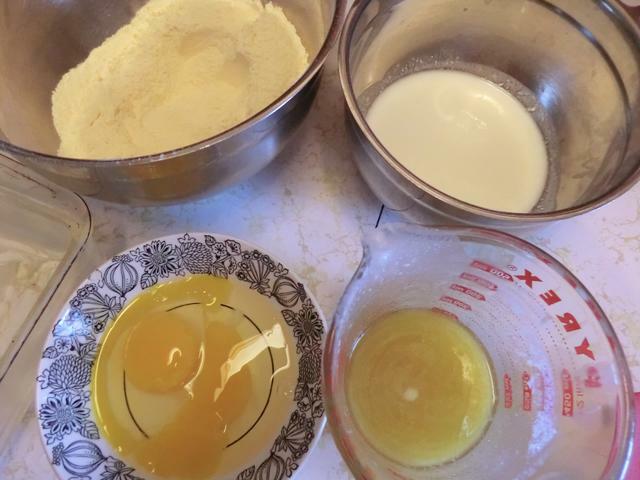 Whisk in the sugar, then the eggs, one at a time. Stir in the vanilla. Stir in the nuts. 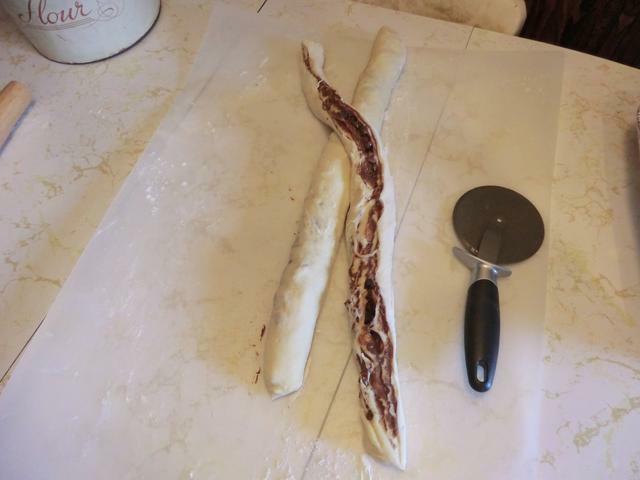 Combine the flour and salt in a separate bowl and then fold into the cocoa-butter mixture, until just combined and you no longer see white floury areas. 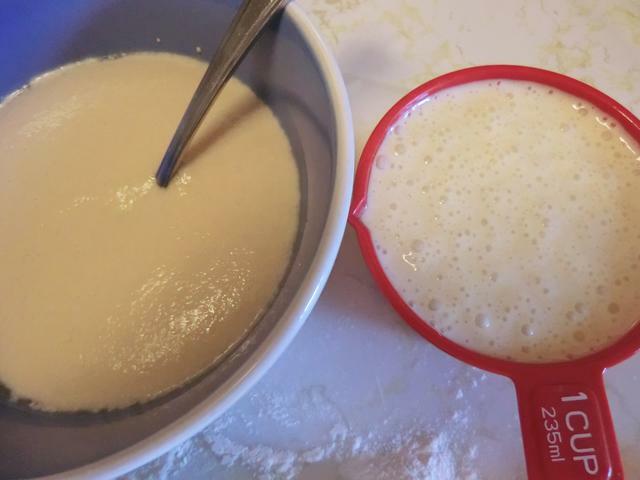 Pour into pan and rap the base against the table to get rid of any bubbles in the batter. 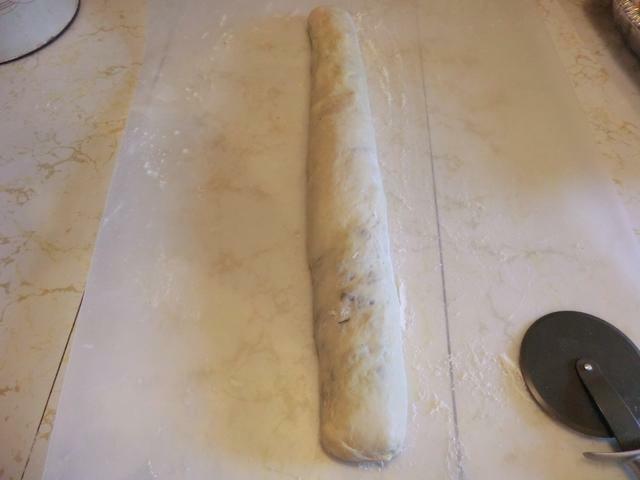 Bake 40 to 45 minutes or until a toothpick inserted into the center comes out with just a few crumbs. 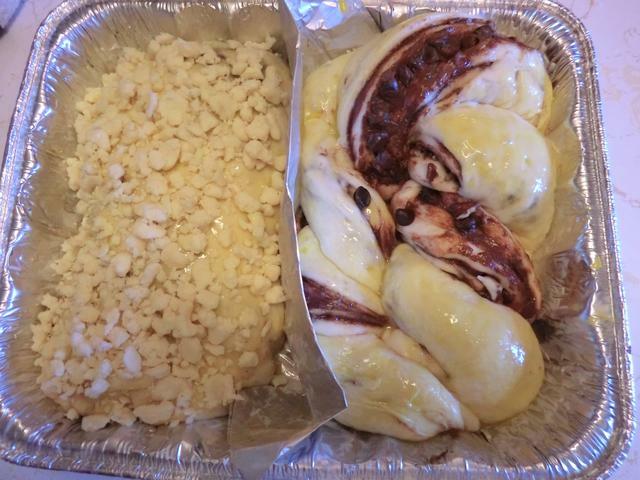 Do not over bake; the brownies should be gooey. 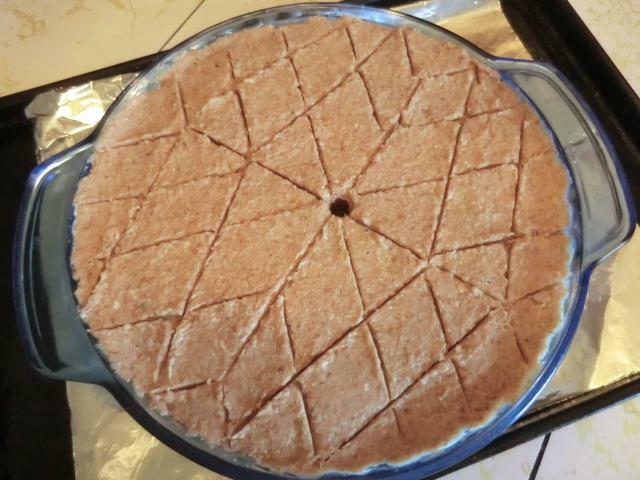 Let cool completely in the pan, then remove and cut into bars. NOTE: The thin, shiny crust shattered when I tried to cut it, both with a serrated and a smooth knife. I thought it might be the nuts but someone suggested using a plastic knife instead. I have 2 more pieces (they’re small) left in the freezer but I’ll give it a try when they’re gone. I’ve been neglecting my ‘abc’ tagged posts. I had been debating between kale, kirsch and kefalotyri but I finally committed. I’ve used kirsch but I don’t think I made a big deal of its inclusion and, until I decide on a Greek menu, I won’t be buying kefalotyri for the ‘saganaki’ appetizer. For someone who doesn’t care for most veggies … kale is a recent add that I love. It’s hearty enough to add to soups and stands up to freeze/thawing without turning into total mush. My latest bundle got turned into the dishes below. 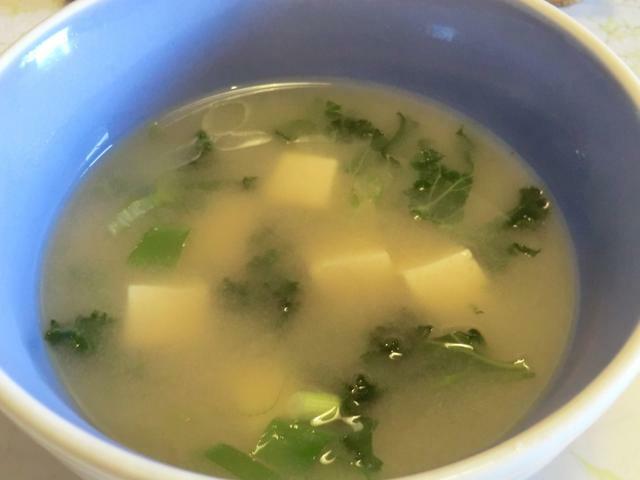 Kale and White Miso Soup, which you’ve already seen posted. 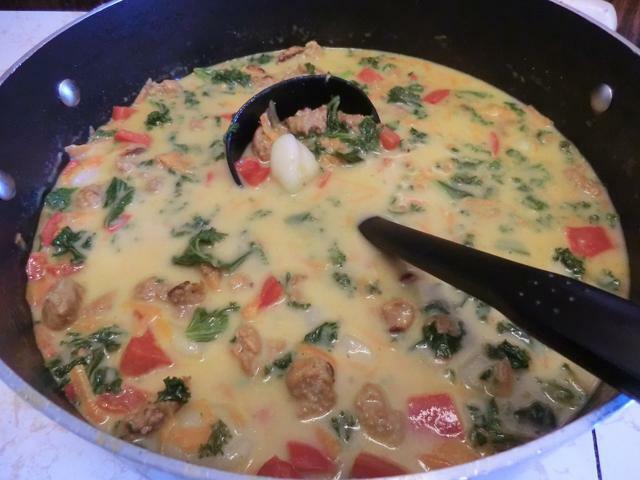 For a heartier kale soup … a copycat Zuppa Toscana with Potato Gnocchi. 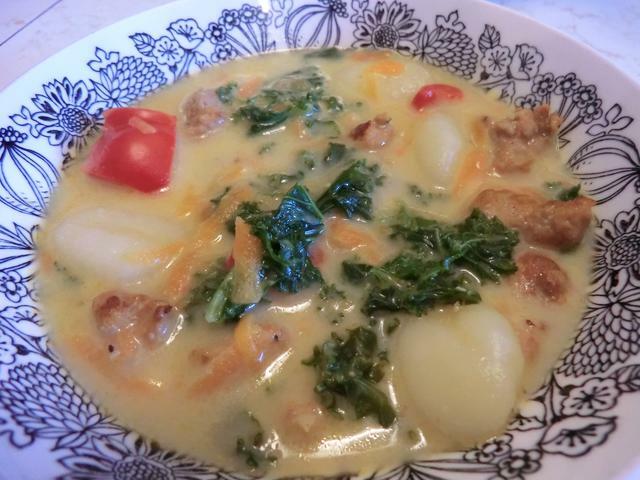 I’ve made this soup, before with a package of tri-colour gnocchi (and called it something more generic) so when I spotted one pound packages of fresh potato gnocchi for 99 cents, I grabbed two and threw one in my freezer. I threw shredded carrot and diced red pepper into the soup along with the kale. Hot Italian sausage give it a nice kick. 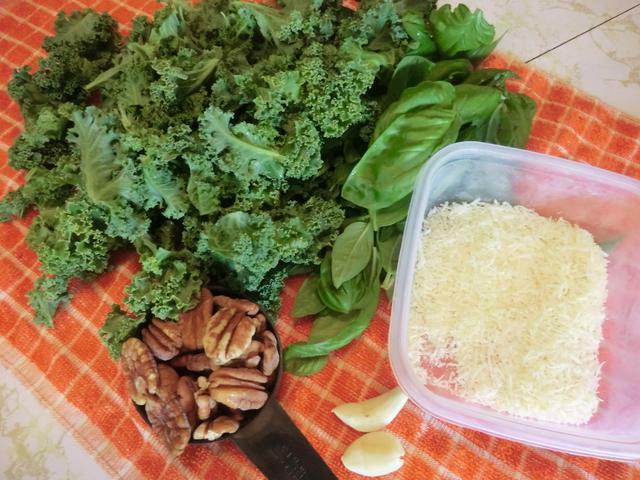 Kale Pesto … finally, I made the kale pesto I’d meant to post last time. I threw some Italian basil (and about 1/4 cup of Thai basil too) into the pesto for added flavour. It’s a great way to extend pricey basil, especially during the winter if you’re buying those little bundles of fresh herbs. I was going to use walnuts as my ‘nut’ but I only had about a tablespoon of walnut pieces left in a bag in the freezer. So, I made the trek to the basement and measured out 1/2 cups of pecan halves. 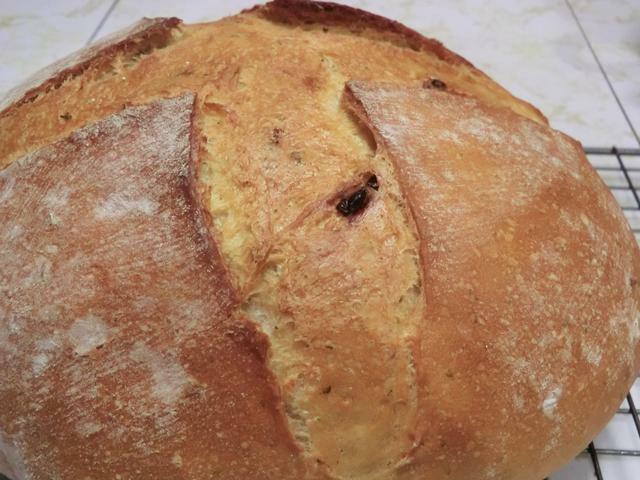 They’re a lot ‘meatier’ than pine nuts and match the bold flavour of the other ingredients. Instead of Reggiano Parmigiana, I used the last of the Grana Padano I found grated in a little tub in the freezer. I’m saving about a 1/2 inch thick wedge of rind for something special along with the rind from my current Reggiano. 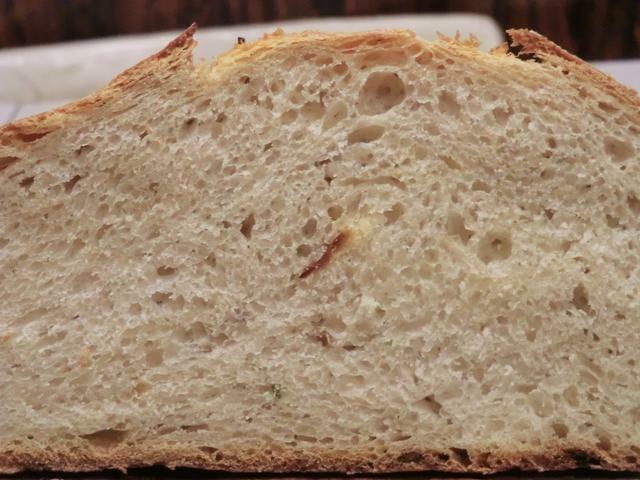 NEVER EVER throw away the rind from your pricey Italian cheeses. 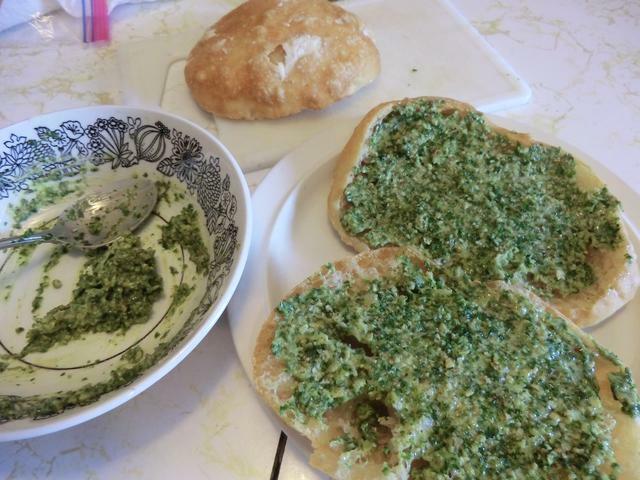 I’ve got 4 ciabatta buns in the fridge and one that I’d sliced open to show the crumb in an earlier post was a bit ‘dry’ so I slathered both pieces with some of the kale pesto mixed with margarine, since I’m out of butter. 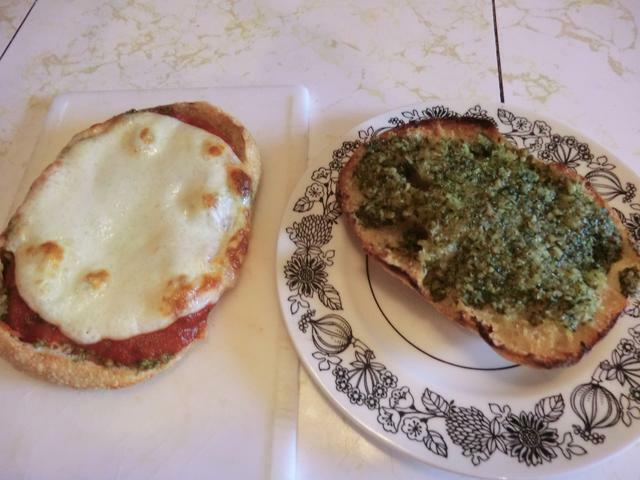 I spread some spaghetti sauce and a slice of Provolone cheese on one half and then I put both halves of the bun under the boiler for 2 1/2-3 minutes. It’s a great snack, appetizer or even a lunch if you’re too tired to make something more substantial. I’m going to freeze the rest of the pesto in 2-3 tbsp portions to keep the fresh flavour. And there’s MORE kale in the fridge.